1. BW883-K hotel wireless door lock is a type of simple mode. With Sub-Ghz technology, the communication distance of BW883-K is very long. 2. Type 1: BW883BG-K, bright gold color. A controller of BW883-K wireless lock can control 50~100 locks. 3. Type 2: BW883SC-K, stainless steel wiredrawing color. BW883-K is another product which is designed for large hotel and office building. ◎ Sub-GHz Technology: available to real-time communicate in long distance(outdoor: 500 meters, indoor: 30 meters). ◎ Easy installation, the door lock does not need to separately set the magnetic switch and additional wiring, and the 50~100 locks only need one controller. ◎ Low power consumption, each lock needs 4 AA alkaline batteries, saving hotel’s cost. ◎ Integrate easily, BW883-K wireless network lock provides COM+ technology interface and a test DEMO program, making the ordinary Wifi, Bluetooth, mobile phones and walkie-talkie completely staggered to avoid interference with the lock communication. ◎ Emergency protection measures, if the system fails, the backup lock and the backup card will take effect. If the battery is out of power or other situations, the mechanical key can open for emergency. ◎ Security & alarm, with strict security design, such as encrypted proximity card, alarm function and mechiniacal keys, it makes the hotel occupancy rate higher. ◎ Door lock shell and handle: using alloy, stainless steel or pure copper, it is sturdy and durable. The surface adopts PVD electroplating treatment technology to ensure that the lock will not fade or corrode above three years. ◎ Lock body: the surface is imported electrodeposition paint plating process, it is not rust for more than a decade. ◎ Lock latch: using 304 stainless steel and tongue protection patented technology. ◎ Handle style: meeting the international norms, there are left and right handle (LH, RH). ◎ With intelligent cloud platform,it is easy to unlock with 5 ways: APP, RF card, Wechat, computer and mechanical key. ◎ All need in on card: The card of BW883-K hotel wireless lock can open hotel door lock, the elevator and others, which is much more convenient for more customers. ◎ OPENA software, BW883-K has been successfully docked with OPENA software, which makes the hotel lock system run better. ◎ Strong Anti-interference, 220 wireless communication channels can effectively avoid crosstalk of other devices, such as Wifi, bluetooth, mobile phone and walkie-talkie. such as Wifi, bluetooth, mobile phones and walkie-talkie. 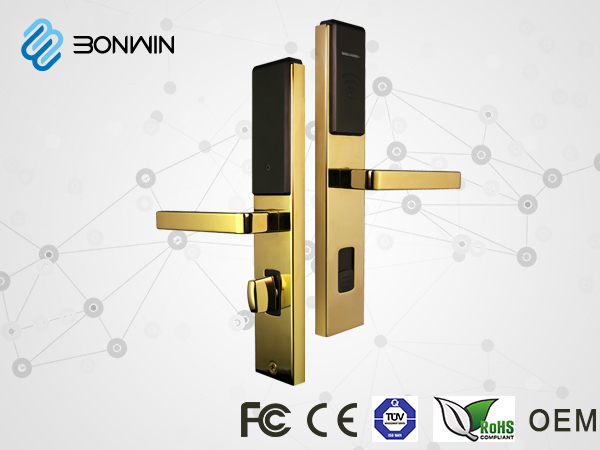 ◎ Long service life, with 304 stainless steel as spring bolts and latch protection patented technology, the working life of the door lock is over 15 years.